If you have any questions regarding these, feel free to ask in this thread or ask a staff member. In the top right corner of each post, there is a report button. This can be used to report a post that you find that you believe is within breach of the rules. You can also select a reason why you are reporting it and type into a text box to explain why this post should be brought to the staff's attention. If you are curious to see if it works, feel free to test the function selecting the "other" option and typing into the box that you are testing it. The staff may also wish to test this, as it has been used so rarely. The testing of this function is allowed if you are a new member or through the rest of this month of February. Friends and Foes can be managed via your profile in the "Friends and Foes" tab. You can also go to a member's profile and click to add them as a friend or foe via their page. If a member becomes your friend, you will receive slide-in notifications (unless set to do otherwise) for when they sign in if you are currently online. They will appear on your friends list and there are several preference settings that you can set to "friends only." If you set a person as a foe on your list, they will not know they are on your foes list, nor will anyone be able to see your foes list except for you. This function serves only in hiding the posts of any and all foes that you have to prevent from any such members from further annoyances towards you. If you are in role-play with a foe, however, or wish to see one of their posts, you are able to click an "unhide" option that will appear where their posts are located. Visitor Messages can be viewed on your profile via clicking your username, rather than visiting your profile through the Navigation Bar. Simple select a username and then click on the "Visitor Messages" tab. You can also leave a new message on another member's profile by clicking this tab and then clicking the button that says "New PM." This way, you can leave a post/message on their profile page that will be viewable to all and they will be notified of the post made via their notifications and/or email. If you visit your own profile page, you will also be able to hide or delete any messages that you no longer wish to see on your profile messages page by clicking the option to hide or delete them in the top, right hand corner of each post. If the member leaving the message has a signature, their signature will also appear in the visitor message they are posting to you. If you are making a post, but are called away or must temporarily leave, you do not have to worry about losing your post. Simply preview the post and select the "Draft" button that is between the "Send" and "Preview" buttons. This will then save your current work into the "drafts" tab, which can be found via your profile on the Navigation Bar. From the drafts tab, you can delete, edit, and complete your post, select send, and it will immediately post up your work onto the thread that you originally posted under. Please note, however, that the draft function is not available through a regular quick reply or when starting a topic--as such, you must careful when starting your own topic and you must preview your quick reply for the button to appear. Through your preferences, you can hide that you are online, which will prevent your username from showing up on the "Who is Online" section. This can be done via your profile in the Navigation Bar through the "preferences" tab. Anyone is able to do this, should they wish to do so, and you will be able to see that you are hidden if your username appears within italics. Please note, however, that staff members can see all hidden members, as they have the permissions to do so. Additionally, you cannot hide from anyone that is on your friends list--all who are on your friends list will be able to see you if you are hidden, your name will just be in italics on their screen. You can tag another member in any post on the forum, by using the tagging icon of "@" before their username. When a member is tagged, they will receive a notification in their toolbar to let them know that they have been tagged, which will also link them directly to the post that you wish to direct their attention to. When tagging a username, it is important to write the username correctly. If it is not spelled or capitalized correctly, the member will not be tagged. However, when tagging a username that has a space in it, you must include quotation marks around the username, as well. Hastags are just the same as they work on twitter or other similar sites. Simply place the number sign symbol before your text (it cannot have a space in it, so underscores are usually used) when you are posting to leave a hashtag. Anyone following a particular hashtag will receive a notification when it is used. To follow a hastag, simply go to your profile and find the "tags" tab at the very end of the tabs list. There, you will see a field where you can type in the tag that you would like to follow and add it to your tags list. Then, you will receive the notification when it is used and you will also be able to click on the tag in your list to bring up all posts where that hashtag is used. The signature toggle feature allows you to either hide or show signatures across the entire forum. If you don't want to see the signatures that everyone has at the bottom of their posts, you can leave them hidden with a simple click. Now, there is a theme changing drop-down menu on the top right corner of each page (underneath the search bar), allowing you to have full color customization of your view at any time! You can also select a "random theme," which will change the theme's color every time you open or refresh to a new page! Please note that the theme/color changer only changes the dominant color of the board. It is not meant to change any of the blacks, greys, etc. If you'd like to suggest a color for the changer, you can PM JerriLeah7 or HikariKuragari with your ideas and we will get back to you on whether or not your color can be added. On the top left of the screen, you will see two buttons on the index and three buttons on any other page! The icon of three lines will take you to the quick navigation, preventing any need to scroll up to reach the navigation bar. The icon of a gear or cog will show you the index widgets when you are not on the primary, index page. This prevents your posts from being scrunched in while you are reading. Lastly, the speech bubble icon will take you to a full-screen chat-box from any page with ease and comes with a counter in the corner of the icon to inform you of how many members are in chat. You can now add your own personal rank via your profile. This field is easy to edit and can be customized with the same codes used in your every day posts. (BBCode) Additionally, it's easy to change at any time and will show up on your posts just under your official rank at all times. No explicit content or visually disturbing color mixtures that make your rank difficult to read will be allowed. Additionally, we do not accept images to be placed, so your personal rank should be text only. If you break the rules, a staff member will remove your personal rank for you if you do not do it yourself when asked. SPECIAL NOTE: Please understand that overly-large emoticons do not need to be used excessively in the chat-box and most certainly should not be spammed with. They take up a lot of space here and can make keeping up with a conversation rather difficult for those that are multi-tasking. Thank you! Instructions on how to use the Personal Emoticon feature is below, as written by the creator, Ange Tuteur. Be sure to thank him for all of his hard work and for his dedication, my friends! Below is a list of instructions for using this plugin. To add new emoticons, go to your edit profile page, click the textarea for the "Personal Emoticons" field, and follow the steps below ! Your new emoticons should now be available ! To make finding emoticons easier, I along with a few members selected some websites which you can pass along to your members if you like. Since the field is limited to 15,000 characters, you can use TinyURL to shorten image URLs if necessary. 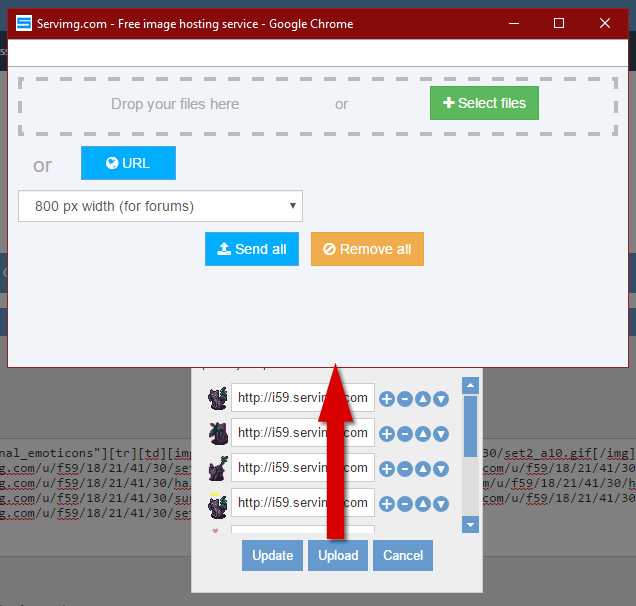 If you don't have a direct link to an image, but a file on your computer, you can use the upload button. Clicking this button will open servimg so that you can upload your emoticons. Tired of the emoticons you've added and want to remove them ? Go to your edit profile page, click the textarea for the "Personal Emoticons" field, and follow the steps below ! Click the "-" button to remove a custom emoticon. The emoticon is now obliterated ! Are your emoticons not in the right order ? Don't worry, you can sort them ! To sort emoticons, go to your edit profile page, click the textarea for the "Personal Emoticons" field, and follow the steps below ! Click the up or down buttons to change the position of your emoticons. Click the "Update" button to update the textarea when you're done sorting. Everything is in order now ! Custom Emoticons are just like any other emoticon, except they're defined by you, the user ! To use custom emoticons, simply proceed to a topic, open the emoticon drop down ( or choose them from the side ), and scroll to the bottom of the emoticon list if necessary. Your custom emoticons will always be at the top of the emoticon list by default, unless the admin chooses to display them at the bottom. Simply click the emoticon to add it to your post ! 6. Why wont my emoticons update ? Tutorial written by @Ange Tuteur. Special thanks to Valoish for the idea and to the Beta Testers for testing this plugin. Additional thanks to @Luffy and Valoish for suggesting websites where you can find emoticons. FYI for for the foes. All the foe posts will show as hidden. You are able to unhide individual posts. If by chance you are in a RP with a "Foe" you are able to unhide the individual posts and read them. Okay, the information was added. I'm pretty sure the "you" before "your friends list" should be "on". Edited; thank you very much! !